If last year's reading list is anything to judge by, I think it's safe to say I'm a decided fan of Abigail Reynolds. I've always been a big fan of "What If" scenarios, so her Pemberley Variations series seams perfectly geared toward readers like me. The following is an excerpt from Noble Connections, and needless to say, it's on my to-get list. But one of you lucky loves will get to win a copy! Check out the excerpt, and then enter to win below! And keep an eye out for more Abigail Reynolds in AIA! The lane was, in fact, little more than a grassy track, but Darcy’s handling of the team allowed them to avoid the most uneven ground. When the lane began the winding ascension to the moors, the curricle was at such an angle that Elizabeth was forced to lean forward. Although the slope was steep, the horses did not seem unduly troubled by their load. She hoped the descent would be as simple. As they rounded a large rock formation, the wind abruptly picked up, tearing at the ribbons of her bonnet as the moors were dramatically revealed before them. An expanse of uneven dark ground covered with small scrubby plants seemed to stretch to the horizon, a startling change from the verdant valley they had just left behind. It was simultaneously desolate and invigorating – or perhaps the invigorating part was the wind that whipped across the plateau. In the valley it had been no more than a pleasant breeze, but here she could hear it whistling over the untamed ground. There was no sign of humans or habitation, only a few dots of white indicating the presence of grazing sheep. The horses ambled along the track which seemed to lead nowhere in particular. She turned to Darcy, only to find him watching her with a certain intensity that made her pulses flutter. “It is like a primeval landscape,” she said. “I hope it meets your expectations,” he said in an oddly formal voice. The track turned to climb a slight incline where some exposed rocks showed at the top, then came to an abrupt end. Darcy reined in the horses. “I wondered where this track led. It looks like we will need to proceed on foot from here.” He swung out of the curricle in a smooth movement, then came around and offered her his hand as she carefully descended the high steps. “A stone circle? Like Stonehenge?” Excitement rose in her at the unexpected treat. “I cannot say, though it seems likely.” Darcy remained just outside the circle, his attention focused on Elizabeth more than the stones. Another gust of wind snatched Elizabeth’s bonnet, this time managing to tug it off until it hung by its ribbon behind her head. “Oh, bother!’ she exclaimed as a thick lock of curly hair slipped out of its knot. Crouching down, she searched through the grass for the hairpin that had been pulled out with the bonnet. Darcy knelt beside her. “What are you looking for?” He ran his gloved fingers over the loose peat. “A hairpin.” Elizabeth parted a clump of grass with her fingers. “I would not worry, but it is one of Lady Bentham’s. My own hairpins are not fine enough for Bentham Park. Oh, there it is!” She reached out for it just as Darcy stretched out his own hand, and their fingers met with a shock. Neither moved for a moment, then Darcy carefully picked up the hairpin and handed it to her, his fingers skimming her palm as he did so. Despite her gloves, Elizabeth felt a burning sensation where he had touched her. Almost involuntarily she raised her eyes to meet his. It was like the moment in the pergola all over again, except this time she was not in a formal garden with Eleanor and Paxton nearby, but completely alone with him on a deserted windswept moorland, her bonnet blown off and her hair half down. She should feel frightened given her vulnerable position, but somehow she knew he would not hurt her. Instead she felt her insides turn to liquid from the knowledge of his desire for her. Tugging off his glove, Darcy reached out and touched her hair reverently, letting it flow through his fingers. Elizabeth’s stomach flip-flopped as the sensation of his hand in her hair made her long to be closer to him. What was wrong with her? She should not be allowing him to touch her in any way, even if it was just her hair. Though truth to tell, it would not sound particularly compromising if anyone heard of it. Even the ladies of Meryton were not so silly as to say, Why, she is quite ruined! A man has touched a lock of her hair! The thought made her smile mischievously. The slight movement was enough to draw Darcy’s attention back to her face. A look of shock crossed his features, then his hand left her hair to caress her cheek. With his forefinger, he lightly traced the shape of her lips, leaving a burning trail of sensation behind. Elizabeth could not have moved had her life depended on it. Her flooded sensibilities rooted her in place, and the depth of his dark eyes mesmerized her, especially as he began to lean closer to her. At some level she recognized he was about to kiss her and she should stop him, but it seemed unbearable to do so. His eyes were warm as he put a finger under her chin. There was an endless moment when she seemed to have forgotten how to breathe, then his lips were moving gently on hers, filling her with a burning sensation, yet seeming to pull her very soul from within her. So this must be desire! Whatever it was, it certainly was pleasurable, and the astonishing feeling of his warm mouth caressing hers made her skin tingle. Who would have thought that her lips could be so sensitive, or that they could send pulses of heat throughout her body? It lasted only a few seconds, and when he drew away, she felt as if she had lost something precious. She did not know what to expect from him now, but she was shocked when he suddenly withdrew. His hands dropped to his sides as he straightened and rose to his feet, his expression forbidding. Dismayed, she stood as well, even though he had not offered her his hand. She had thought he would be pleased. What had she done to anger him? Elizabeth blushed. “I require only a few minutes to repair the damage. You might wish to keep your back turned if you prefer to avoid seeing even more of my hair down.” Without waiting for his reply, she ducked behind the curricle where she was more protected from the wind, then pulled out the remaining hairpins. Shaking her hair free, she ran her fingers through it several times to bring it into some kind of order. That was when she realized Darcy had not turned his back. He was lounging against the curricle only a few feet from her, his arms firmly crossed across his chest, his eyes fixed on her with a burning look that made her breath catch. The goose bumps on her arms had nothing to do with the wind. Feeling hot and cold at the same time, she managed to arch an eyebrow, hoping her expression would prevent him from guessing how thoroughly nonplussed she was by the way he was looking at her. Given the sensation created in her from the touch of his eyes, it might as well have been his hands that were running through her hair and over her body. The almost visible control he was exerting over himself charged the atmosphere. The correct thing to do would be to bind up her hair as quickly as possible, but Elizabeth was not ready to give up this moment, so she shook out her hair again before parting it into sections with deliberate slowness. Lingering as she looped up one section at a time, she thrust each hairpin in place. “Better?” she asked archly. She did not know what to expect from him next, but he merely handed her into the curricle and drove down into the valley, giving no evidence that anything unusual had occurred between them. It was disappointingly anticlimactic after the power of their connection on the moor. Perhaps he was as uncertain of what he wanted as she was. Certainly he had given no hint a proposal was forthcoming. She knew now that he was still attracted to her, but it did not follow that he had any intention of renewing his offer for her. Of course, she was not sure that she wished him to. Discovering that she enjoyed his touch was not the same as loving him, was it? His long, tapered fingers held the reins loosely. He had not replaced his gloves, and her eyes were drawn to the strength of his hands, the shape of his knuckles and square fingernails. Those fingers had touched her face, and she could still feel where his touch had traveled along her cheek. She had never given a thought to a man’s hand before, but she realized his were beautiful, tempting her to run her own fingers along his, learning every line of them. What was wrong with her? She had seen men’s hands many times before. Why did her stays feel suddenly too confining, as if her skin could not stand the touch of the stiff whalebone against her ribs and breasts? She had to look away. They were traveling down the steep slope at the edge of the moor. Darcy appeared completely in control of the horses and the curricle moved steadily, but her position felt oddly precarious, as if she might somehow fall. It was foolish to feel afraid, but she held on tightly to the seat until they reached the valley. Her heart was still racing as they followed the lane, passing between fields bordered with dry stone walls. A shepherd and his dog herded sheep two fields away, and the main road was in sight when Darcy surprised Elizabeth by pulling the horses to a stop. “Is something the matter?” she asked. “Of course.” If there was a problem with the harnesses or reins, it was not obvious to her. Mystified, she said, “I suppose so.” She turned over the knife in her hand, but saw nothing unusual about it. Warmth kindled in his eyes. His voice was husky as he said, “Since I do not have a hairpin to give you, I hope the knife will prove an adequate substitute should you feel the need to defend yourself.” And before she could even comprehend that statement, he slid closer to her until she felt his thigh pressing against hers. Cupping her cheek with his hand, he turned her face toward his and captured her mouth in one swift motion. Their kiss on the moor had been gentle and tentative. This one was something else altogether, like the difference between lighting a candle and kindling a bonfire. This time his kiss staked a claim, smoldering with the same urgent hunger she had seen in his face as she arranged her hair, but now he had loosened that tight restraint that had kept him in check earlier. His teeth nibbled on her lower lip, probing and questing, stimulating and provoking her until she gasped, surrendering her mouth to his possession. She had caught glimpses of people kissing like this, but how could she have known that it would be so consuming, that his probing tongue would unleash cravings she had no notion of controlling? Her instincts knew what to do, and she met his sweet torment half way, her hands rising involuntarily to grip his shoulders as if he were the only solid thing in her world. His hands roamed down to her back, pulling her close to him until she felt the hardness of his chest pressing against her. Had she truly believed the waltz was like an embrace? It had been nothing compared to this heated intimacy, a thirst that yearned to be quenched, yet instead grew fiercer by the second. She knew she should not be allowing this, but instead of pushing him away, she arched against him. “I know.” Even she could hear that her voice throbbed with longing, and she had to force her fingers to release his shoulders. Flushed with embarrassment, she straightened, already aching to be touching him again, and too embarrassed to look at him. His self-possession seemed equally tested as he moved away from her. After staring at the horizon briefly, he rubbed his hands over his face. He took a deep breath, then slowly released it. “Good God, Elizabeth,” he said quietly, then he muttered something under his breath. She considered a teasing answer, but that could lead into a discussion she was not ready to have, not while they were alone together in a curricle and she still ached for his kiss. She should say something, but after her display on the moor, not to mention her passionate response to his touch, it would seem Missish at best and hypocritical at worst to reproach him. She compromised by testing the edge of the knife on her finger. “I hope you realize this is quite sharp, Mr. Darcy,” she said. “If it were not, the stable boys would have to answer for it. I suppose, though, it is not quite the thing when we are in motion.” He handed her the sheath just as they reached the road. She slid the knife into the sheath, looking up at him through her eyelashes. His attention remained on the road as he urged the horses to a canter, but she thought she could detect a pleased look on his face. 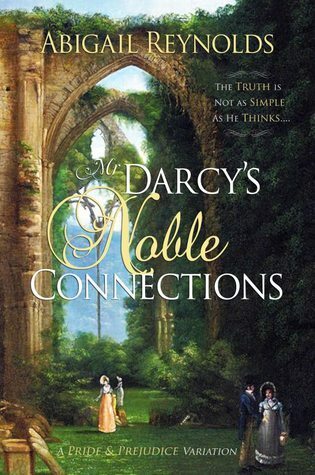 Abigail has offered up one e-copy of Mr Darcy's Noble Connections to one lucky winner. This giveaway is international! There’s only one fact that notorious rake Lord Charles Carlisle and his cousin, Fitzwilliam Darcy, can agree upon: a house party given by the Marquess of Bentham is bound to be intolerably dull. That’s why Lord Charles is delighted to accept a bet that he can seduce his sister’s pretty friend during their stay at Bentham Park. After all, it’s easy money for an experienced seducer, and it will relieve his boredom. Why should he care if his staid cousin Darcy disapproves? But when Darcy discovers that Lord Charles’ new target is none other than Elizabeth Bennet, the woman who just refused Darcy’s offer of marriage, he cannot stand by and watch as the woman he still loves is callously ruined. What he doesn’t know is that Lord Charles has a dark secret, and that his attentions to Elizabeth may not be what they seem. But Darcy has a secret agenda of his own at the house party, one that could change everything change everything at Bentham Park. Add in a midnight rescue, clandestine meetings, a long-lost son, conspiracies, blackmail, and an attempted elopement, and suddenly this house party is anything but dull. I've read many of Abigail's books, but I guess either Mr. Darcy's Refuge or Mr. Darcy's Letter other than this new one since those are the only ones I haven't read. I have this book, very much enjoyed it. I've read quite a few Austen variations, and my favourites are both by Abigail Reynolds - The Last Man in the World, which I got after reading your review, Misty, and Mr Darcy's Obsession, which I thought was fantastic. I like the variation of Elizabeth accepting Mr. Darcy's first proposal. Some of my favorite variations have been where there are prior meetings between E&D, even if it was shortly before canon. Love to see more of those or where Mrs. Bennet has a bit more intelligence and subtly about her and her marriage plotting for her daughters. I love Abigail 's variations! I'd like to see if Darcy had considered Caroline Bingley. i would love to read more variations which focuses on Georgiana Darcy!!! Abigail Reynolds writes some of the best Austen adaptations. I'm a fan and a fellow cheesehead! Really hoping I win this prize!!!! This book sounds fantastic. I love reading any well-written variations! I've read two of Abigail Reynold's other works (What Would Mr. Darcy Do and The Last Man in the World) so I would probably pick up any of them if I could! I love her variations so I would be great to read them all. What "Pemberley Variation" would [I] be curious to read about? If the Bingleys had arrived without Darcy and Wickham was well ensconced into relationships with them and the community including the Bennets [& Lizzy!] What happens with Darcy's arrival...? TY for the great giveaway - MUCH appreciated and anticipated reading!